The storyworld in which my first novel, Alara’s Call, and the other books in the series are set is modeled after nineteenth-century Europe, with all the small countries close together and interrelated royal families and court intrigues. But for all its differences, Europe was long united by a single dominant faith, and most countries had similar governing systems. In my stories, I want to examine several contrasts. This meant I had to set up the storyworld in ways that differ from Europe. 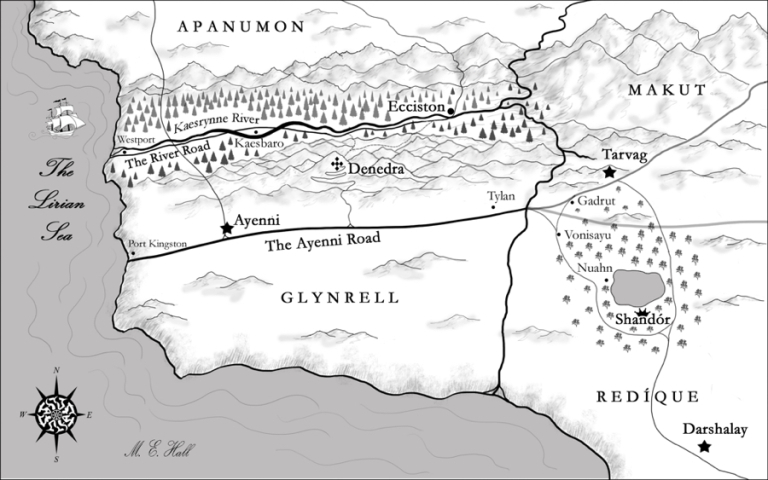 Mary Elizabeth Hall helped get my storyworld out of my head and onto a map. When I started, the sea didn’t have a name. She convinced me to give it one. Alara is a Telshan cleric. Telshanism is a religion closely modeled on Christianity. So one of the things the storyworld needed to have was a polytheistic religion. There are several such traditions in Europe, though they gave way to Christianity centuries ago. The main inspirations for Kivatanism, the polytheistic religion of Alara’s opponents, were the Greek and Norse pantheons. The northern nations of Apanumon and Makut are predominantly Kivatan, while the southern nations of Glynrell and Redíque are predominantly Telshan. The Telshan faith is Trinitarian, with an important difference from Christianity. Some of us occasionally refer to the Holy Spirit as “she,” because doing so helps us acknowledge the feminine nature of God — who must have a feminine nature because both male and female are created in God’s image. I took that notion and flipped it, so Alara’s faith has a feminine Creator, a feminine Redeemer, and a masculine Counselor. This has led some people to liken Alara’s Call to The Shack, but I’m pretty sure none of those folks have read my book yet. It was important to me not to have an all-female trinity, because that would incline people toward matriarchy, which isn’t where I wanted to go. Because matriarchies are not often found in modern culture, I am more concerned with using these stories to examine the differences between patriarchy, which we often still find, and egalitarianism, which we currently strive for yet often fail to achieve fully. In Christianity we have a verse that says “There is no longer Jew or Greek, there is no longer slave or free, there is no longer male and female; for all of you are one in Christ Jesus” (Galatians 3:28 NRSV). Yet we often don’t behave as if that were true. I’ve given the Telshans a similar verse, and it informs every story in the series. My construction of Telshan culture exists largely to show what a truly egalitarian society might look like. To contrast that, I established the Kivatan countries as being strongly patriarchal. Their faith limits women’s roles and restricts their activities. The Kivatan faith allows polygamy and gives fathers complete control over daughters’ lives. Women do not participate in the public sphere at all, while in Alara’s country women have complete freedom. If I’m honest, Alara’s culture is a meritocracy. One’s status is dependent upon one’s abilities and accomplishments. I hope to examine that more closely in Book Two. The United Kingdom’s parliament made a start at democracy, and heaven knows large parts of the French population tried repeatedly to democratize that country. Nevertheless, nineteenth-century Europe was still largely monarchial, as is my storyworld. In Alara’s Call, her home country of Glynrell, where the Telshan faith is predominant, stands as the only democracy. Alara’s mission becomes advising world leaders about democracy and egalitarianism. Naturally, they are not too pleased by her message. Much of the conflict, not only in this book but in those that follow, centers around the desire of monarchs to hold onto power despite the will of the people and the words of the prophet. Of course, anyone who knows anything about European history can see where this is going. I trust that the fantastical spins on the journey will make the effort worthwhile to readers. When you’re creating a storyworld, whether it’s fantastical or historical, consider what you need the storyworld to have for your story to do the things you want to do. Setting is an important element of fiction, and your storyworld can and should both affect your story and be affected by it. This entry was posted in Writing and tagged Alara's Call, Elements of Fiction, Setting.